Tezos is standing out as the lone survivor among the top 20 cryptocurrencies today, as the market sharply corrects during the Asian trading session. Right now the asset is holding on to a 3% gain over the US dollar, but still trading just shy of the psychological $1.00 level. 24hr trading volumes have begun to thin from yesterday’s close; down $3 Million since this morning as the asset continues to consolidate tightly inside a pennant pattern. According to Coinmarketcap’s figures, Swiss-based exchange, Bitmax, is currently accounting for over 53% of all XTZ trades today mostly against BTC pairing. 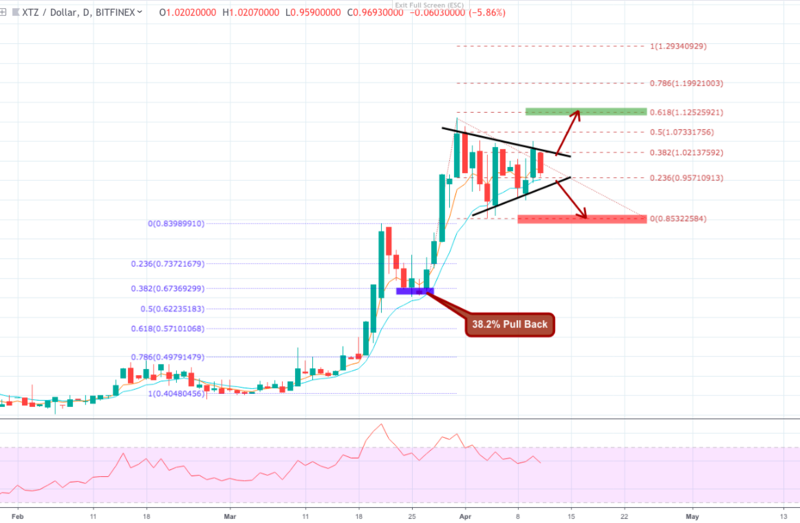 On the 1D XTZ/USD chart we can see that XTZ is consolidating inside a pennant pattern after a late surge of bullish momentum carried Tezos over $1 at the end of Q1. Typically, when the price action enters into a pennant pattern from the bottom it foreshadows a bullish continuation. This however, is largely dependent on market conditions and sometimes candles can actually reverse bearish if buyers lose confidence during the breakout. In order to confirm which direction the breakout will occur, we still need to wait for XTZ to make further higher lows and lower highs until it reaches maximum consolidation. From there, traders need to monitor trading volume and ensure stop losses are used in case of a bearish reversal. Using the fibonacci retracement and extension tools, we can ascertain where these breakout targets are likely to be. During the first impulse movement which peaked on March 21, we can see that the price action corrected down on to the 0.382 (38.2%) fibonacci retracement level, at $0.67. Using this point (blue shaded area) as the initial swing low, we get the resultant fibonacci extension levels after identifying the new swing high and finishing at the new swing low. Looking at the results we can see that the 0.618 fib extension level at $1.12 is a likely opening breakout target, if bullish traders overpower the bears during consolidation. Alternatively, the 0% fib extension level at $0.85 is the next likely support should increased selling pressure force XTZ to reverse. All ROIs are calculated from the asset’s current value at the $0.95 level (AToW).